Below is the text of the speech made by Michael Howard, the then Shadow Chancellor of the Exchequer, to the British Chambers of Commerce conference on 23rd April 2002. I am very grateful for your invitation to address you today. You timed this Conference well, to come so soon after the Budget – the date of which you obviously knew before everyone else. I am already getting ready to clear my diary for the time of next year’s Conference. But this timing has enabled the Conference to concentrate on the main themes of the Budget. Today I want to focus on what the Budget showed about this Government’s approach to enterprise, and on the approach the Conservative Party is taking to economic policy. We believe that business should be freed to do what it does best: win orders and create jobs. Governments should set in place the conditions which enable it to do so. In part those conditions involve stability. And that means that, in areas of policy where there is room for consensus between the parties, this should be welcomed. Sometimes it comes as a surprise to hear a politician say that. It shouldn’t. Politicians should not seek to differ from each other for the sake of difference, criticise for the sake of criticism and adopt different policies in order to be seen to be adopting different policies. That is just common sense. Business works in an environment which is uncertain enough as it is. Elected representatives should act as forces for stability, not for further instability. Governments come and go. The last thing you want to see is each new administration arriving with its own ideas and plans, determined to uproot everything that has gone before, and completely oblivious to the lessons learnt by its predecessor. So in recent weeks I have pointed to important areas where there is consensus between the parties. One such area is monetary policy – the framework which has been established for setting interest rates and controlling inflation. To the extent that both main parties now recognise the evil of inflation for what it is, and both support the same policy framework for dealing with it, this is a very welcome development. Of course the one – rather large – fly in this ointment is the single currency. I do not intend to say any more about this issue today than this: it is perhaps the supreme irony that at the very moment when we reach inter-party consensus on the framework for monetary policy the Conservative Party is the only Party in favour of maintaining that framework. Joining the single currency would mean giving up a successful system in which interest rates are set in Britain on the basis of what is best for Britain for one in which the European Central Bank does its best to set a single rate for the whole of the Eurozone. It’s difficult enough for the Bank of England to get it right for us. It would be virtually impossible for the ECB to achieve this. But that argument is for another day. As things stand, we have consensus on monetary policy. On fiscal policy, however – the Government’s framework for taxing and spending – the room for consensus is not quite so great. I believe that the two fiscal rules which the Government has established have an important role to play in guiding fiscal policy. 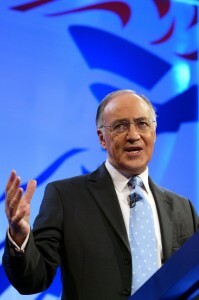 But I have called for the rules to be buttressed by greater scrutiny and accountability; for a greater focus on the outcome of spending – rather than just the amount which is spent; and for the Government to live up to the principles which it has itself set out for fiscal policy – namely transparency, stability, responsibility, fairness and efficiency. It is my belief that the endless series of changes introduced into the tax system in the last few years have taken it far from these worthy principles. When even tax accountants criticise the complexity of the tax system, something is going seriously wrong. And it is often employers who have to bear the brunt of such complexity and never-ending change. In the case of the Government’s various tax credits, for example, it has often been employers who have faced the task of administering them. And as my colleague David Willetts points out, in terms of credits for families alone, within the space of four years, from 1999 to 2003, the Government will have: abolished Family Credit; introduced the Working Families’ Tax Credit; introduced the Disabled Person’s Tax Credit; introduced a Childcare Tax Credit; introduced an Employment Credit; abolished the Married Couple’s Allowance; introduced the Children’s Tax Credit; introduced a baby tax credit; abolished the Working Families’ Tax Credit; abolished the Disabled Person’s Tax Credit; abolished the Children’s Tax Credit; abolished the baby tax credit; introduced a Child Tax Credit; abolished the Employment Credit; introduced a Working Tax Credit. So, since October 1999, the Government will have introduced five new tax credits for families, scrapped four of them and then introduced two new ones which come into force in April 2003. That averages out as a new tax credit for families every six months. A Government which is truly committed to creating the conditions for enterprise to flourish would put an end to such destabilising change. I am afraid, however, that last week’s Budget cast serious doubt over whether we have such a Government at present. I find it difficult to recall any previous Budget which aroused such a degree of hostility from the business community in this country. I think there are several reasons for that. First, the business tax rises we saw in that Budget were in direct contradiction to repeated ministerial statements on the issue. Second, the timing of the rises is appalling. They come at a time when manufacturers are struggling to emerge from recession. And, as the BCC pointed out in its Budget submission, at a time when OECD figures show that business taxation is already higher here than in some of our key competitors. In fact recent figures show that, of our top five trade partners, only France has a larger burden of business taxation. The Chambers estimate that business taxation has risen by £29 billion over the last 5 years. And third, there is the sheer scale of the increases. They dwarf those other measures in the Budget for which businesses have been calling and which they have welcomed – such as the assistance with research and development. In fact, quite apart from and in addition to the £4 billion increase in NICs, the Institute for Fiscal Studies has estimated the net cost to business of the Budget at £1.1 billion, even after the positive measures for business have been taken into account. The consequences for enterprise and employment will be very serious. The rise in NICs for employers is a direct tax on jobs. The Government has now created an additional incentive for firms to hire as few staff as possible – and for larger firms to shift employment abroad. As a succession of business organisations have pointed out, it directly contradicts everything ministers have said about the importance of job creation and full employment. It is of no use to business if the Chancellor spends most of his Budget speech talking about enterprise – a word he mentioned a dozen times – when the remainder is spent outlining measures which will do more to stifle enterprise and job creation than virtually anything else he has done. And it is not as though these tax increases are likely to lead to the improvement in public services we all want to see, for the reasons Iain gave when he addressed you yesterday. Furthermore, the Government has now admitted that public sector employers will themselves have to pay an additional £1.2 billion as a result of the NIC rise. This just goes to show the sheer absurdity of the Government’s position. First they refuse to change and reform the public services, so we will not see the improvements that we all want. Next they increase employee contribution rates for many of the very public sector workers that we are relying on to try to improve these services. Finally they hit the services themselves with a £1.2 billion tax bill, in the name of raising more resources for those very same services. If those tax increases are of concern to business, the final issue I want to address this morning is, I think, of just as much concern. Just before the Budget, the London Chamber of Commerce asked a particularly interesting question as part of its regular survey of business. It asked whether the Government had kept its promise, made in 1997, to cut unnecessary red tape. 97 per cent of businesses surveyed said it had not. I referred earlier to consensus. I think it is fair to conclude that a consensus exists amongst business on this issue. And I doubt somehow that this consensus is confined to business in London. Indeed, after looking at the Red Tape Audit which the BCC published last month, I know it’s not. It is not hard to see why. The latest figures from the House of Commons Library show that 4,642 regulations of all types were introduced in 2001. Not only is that a record. It is an increase of nearly 50 per cent on the number introduced in 1997. I defy anyone to defend that number, to claim that introducing 4,642 regulations in one year is justified. Even if a bureaucrat can find a valid reason for each additional piece of regulation, the presumption should be against it. For the cumulative total – however innocuous each one of the 4,642 regulations is – can have a devastating effect on business. In fact the Chambers estimate that complying with all the different demands placed on business from regulation has cost business £15.6 billion since 1997. Other estimates have put the figure even higher. This, too, is having a direct impact on job creation. To quote one BCC member from Bristol: `Instead of getting myself bogged down with regulations I just don’t employ staff’. And to quote the BCC itself, in last year’s submission to the Chancellor: ‘The bottom line is that the sheer quantity of red tape on business is damaging our economy, stifling enterprise, job creation and economic growth’. Conservatives too were less responsive to these concerns, and less effective in deregulating, than we should have been. But what became clear to us then is that the desire to over-regulate seems to be embedded in the bricks and mortar of Whitehall. It is clear that only a serious and systematic approach to tackling it stands any chance of keeping it at bay. At least towards the end of our time in office, I believe we were taking this approach. It hasn’t been taken since then. The BCC is to be applauded for its efforts to encourage the Government to tackle the problem – through your Red Tape Audit, Burdens Barometer, and Think Tank on regulation. I wish you every success in doing so. I hope I have indicated some of the issues which are at the forefront of our minds as we establish our approach to economic policy at this early stage in the Parliament. In contrast there has been a worrying trend in Government policy. Ministers seem to display a distinct lack of understanding of how the enterprise economy works, and the effect their actions will have on business and those who work and invest in it. They should not think on taxation that they can treat the private sector as a giant milch cow, from which they can extract, painlessly, endless amounts of revenue without it affecting investment, employment or pay levels. They should not think on red tape that they can impose new initiatives or schemes or regulations without it affecting the ability of business to expand or in some cases even to stay afloat. And they should not think, as in the case of Railtrack, that they can ride roughshod over the interests of investors without it affecting their willingness to invest in government projects in future. Any government must understand the importance of the daily decisions taken by thousands of businesses and millions of citizens. Politicians should not divert the attention of business from the vital task I mentioned earlier: winning orders and creating jobs. As everyone here will recognise, the pace of change has never been faster than it is today. The prizes go to those who respond quickly and flexibly. So politicians should engender a climate of economic stability, and should not seek to introduce change for changes sake. They should keep the burdens of taxation and red tape to a minimum. Instead of being in the way, they should often get out of the way. Crucially, which firm wins the order and creates the jobs is decided at the margin. It is at the margin that the extra tax or new regulation can determine whether a company takes on an extra worker or lays one off – and, ultimately, whether that company succeeds or fails. That is a lesson which politicians forget all too easily. But it is a lesson which the Conservative Party is determined to remember. And if we are ever in danger of forgetting it, I know that the British Chambers of Commerce will keep us up to the mark. I welcome that, and I wish you and your members well. Both you and we have work to do.